This page describes how to activate a trial of BizInt Smart Charts products. 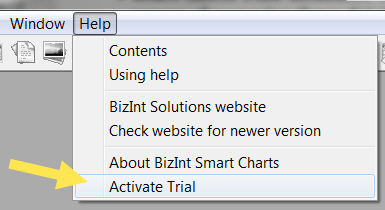 Once you install a trial version of a BizInt Smart Charts product, you will be prompted to activate the software the first time you run it. You should receive an email with a trial activation key from BizInt. Copy the activation key, including the lines "Start-BizIntActivationKey" and "End-BizIntActivationKey", as shown below. Paste the activation key into the panel and press the Activate button. Licensed users of BizInt Smart Charts for Drug Pipelines or BizInt Smart Charts for Clinical Trials can activate a trial of the Drug Development Suite, which includes both products in one. You will need a trial activation key from BizInt. To request a trial upgrade, contact us at trials@bizint.com. Launch the software and choose Activate Trial from the Help menu. 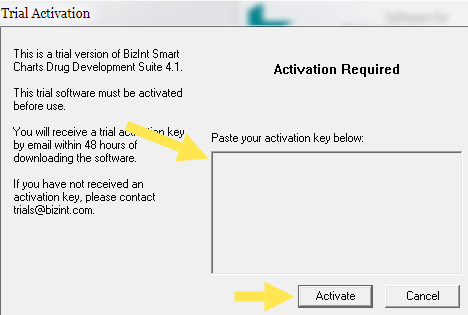 Copy the activation key you received from BizInt and activate the software as shown above.